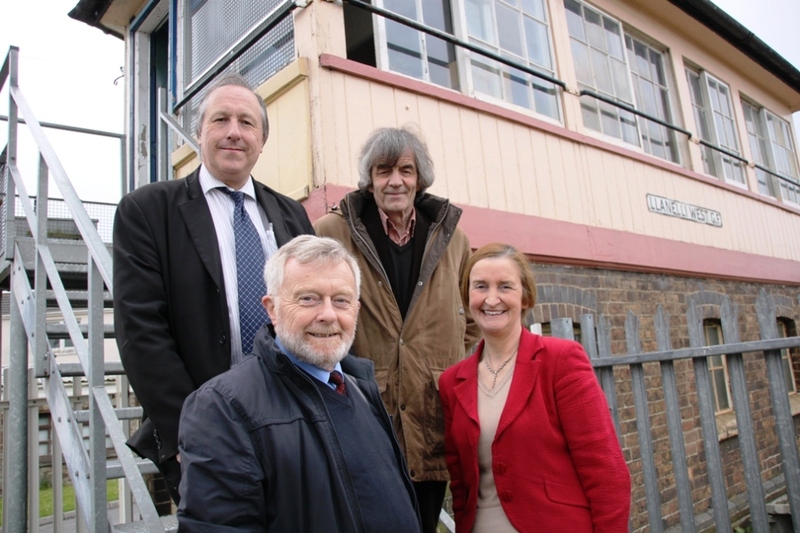 Members of the Trust Martin Doe, Richard Roper, Ken Jones and Nia Griffith MP celebrate the listing of the signal box. Nia Griffith MP, who chairs the Llanelli Railway Goods Shed Trust, has praised Ken Jones, the Trust’s heritage officer for his deft work which has resulted in the Llanelli West Signal Box being granted listed building status by CADW. “Ken has done a fantastic job. On hearing about Network Rail’s plans to demolish the signal box -as they modernise their signalling system – Ken set to work to make a strong case to CADW for listing. He enlisted the support of well-known local historians such as Michael Denman, author of “Railways Around Llanelli”; John Edwards, author of “Remembrance of a Riot – the story of the Llanelli Railway Strike Riots of 1911”; Byron Davies, author of the “Glanmor Foundry and Engineering Company Ltd, ” – and Benita Afan Rees, William Rees and Alwyn Jones of the Glanymor and Tyisha History Group.